Puppy Kindergarten: The importance of beginning puppy training and socialization early is one of the most commonly accepted concepts in the dog training community. Young puppies are like little sponges and their early experiences will stick with them for their entire lives. It is critical that we make those experiences positive. Much of the time in this class will focus on learning how to provide your puppy with positive socialization and handling experiences. Off leash play with other puppies will comprise part of the class. Puppy play is an important part of puppy socialization and during play sessions we will discuss appropriate and inappropriate behaviors, as well as when to interrupt inappropriate play. In addition Puppy Kindergarten will cover some basic foundation behaviors like come when called, sit, and name recognition, and address housetraining and puppy mouthing. Prerequisite: Puppies should be between the ages of 10 and 16 weeks when class starts and should be current on their core vaccines. Video: Why is Puppy Kindergarten so important? Missed the Puppy K start date? You can also start in the second or third class of each session, and get all 4 classes by continuing into the next session. Call 207-642-3693 for details. Pet Dog 101: This beginner obedience class, for all ages of dogs, offers an introduction to the principles of positive training and positive training techniques. 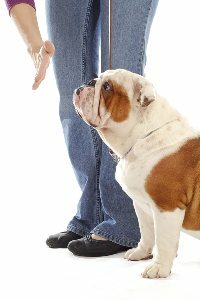 Subjects covered will include the basic obedience skills of sit, down, come when called, stay, and walk nicely on leash. Also covered will be the basics of dog training and how to apply positive techniques to general household training issues. This class will open the doors to training techniques that will help dogs and their human families grow and learn together in a comfortable and happy manner. Class size is limited to allow for plenty of focus on individual needs. Pet Dog 102: This intermediate obedience class is for those who have completed Pet Dog 101 and wish to continue training. Practice skills from 101, learn some new skills, and get your dog to pay attention to you with additional distractions. Increase your dog's desire to work/play with you and come when called through fun games. In addition to strengthening and enriching the dog and handler bond, Pet Dog 102 is also designed to prepare dog and handler teams to move on to other pursuits like rally obedience, agility, competition obedience, canine good citizen, and therapy dog classes. Prerequisite: Pet Dog 101 or an equivalent experience. Combine Puppy K & Pet Dog 101 for a savings of $30! Sign up and choose your Puppy K start date. When you have completed your Puppy K class, please contact our scheduling director, Mallory by e-mail here, or call her at 207-642-3693 and let her know which Pet Dog 101 that begins after your Puppy K is completed works for you! You can sign up for a Pet Dog 101 class that begins right away, or you can take a break and return for your Pet Dog 101 anytime! Combine Pet Dog 101 and 102 for a savings of $40! Sign up and choose your Pet Dog 101 start date. When you have completed your Pet Dog 101 class, please contact our scheduling director, Mallory by e-mail here, or call her at 207-642-3693 and let her know which Pet Dog 102 that begins after your Pet Dog 101 is completed works for you! You can sign up for a Pet Dog 102 class that begins right away, or you can take a break and return for your Pet Dog 102 anytime! Combo packages must be purchased before the start of your first class.